Three evenings earlier, on July 12, Ohio Governor David Todd issued a proclamation. The document directed the Ohio militia to muster to protect the state from Morgan's men. Many militiamen did not hear of the governor's order, and luckily for Morgan, his army faced little opposition. However, on July 18, the Confederates met a small force of militiamen at an earthwork, slowing Morgan's advance. 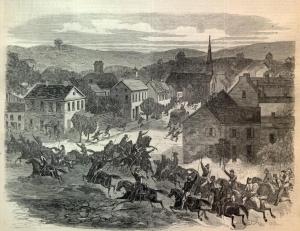 Finding themselves severely outnumbered, the militia retreated that evening. The militiamen's efforts allowed for Brigadier-General E.H. Hobson's Union cavalry to locate the Confederates. Additionally, Union General Ambrose Burnside sent soldiers and gunboats to patrol the Ohio River, hoping to intercept Morgan's Raiders as they crossed the river. Identifying a ford near Buffington Island, an island in the Ohio River, Morgan's men tried to cross the river on July 19. Only a small number of men successfully crossed the river, as Union soldiers under Hobson, including Colonel August Kautz's Cavalry Brigade, and General H.M. Judah had arrived. A battle erupted between Morgan's 1,700 men and the North's approximately three thousand soldiers.